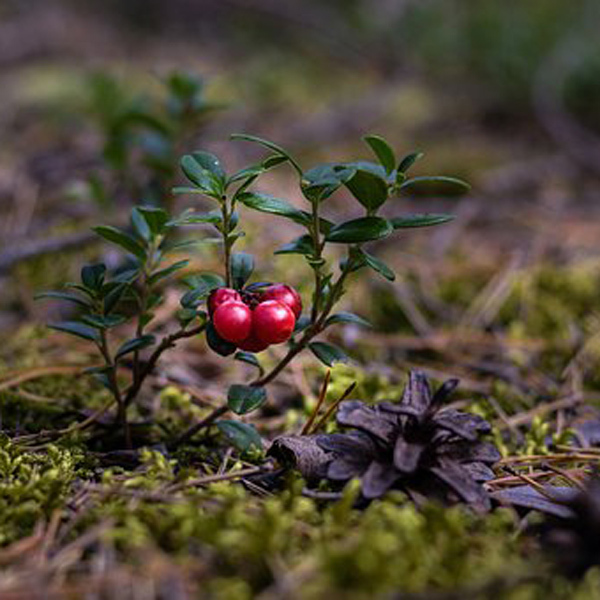 Cranberry grows in the cold, northern wetlands of Europe and America. Though the larger American variety (V. macrocarpon) has stolen the culinary show and is most widely available commercially, wild cranberries have been eaten by Arctic peoples for millennia and are still a very popular fruit for wild-harvesting in Scandanavia and Russia. Traditional Native American use of these sour, astringent berries was to incorporate them into “emmican cakes” along with dried deer meat and fat. Cranberries were also used as a dye, and for medicine that reduced fever, addressed urinary complaints and as a poultice to draw poisons out of arrow wounds. Early American colonists, who dubbed the berries “craneberry” (perhaps because cranes like to eat them) cooked them with maple syrup and ate this sauce with meat. They are highly nutritious as a regular food and juice, as well as a medicine. Cranberry fruits and juices contain large amounts of vitamin C, along with vitamins A, B1, B2, B3, B5, B6, E & K, plus potassium, phosphorus, calcium, manganese, magnesium, sodium, sulphur, selenium, zinc, iron and copper. Not forgetting the other pharmacological bio-active antioxidants known as proanthocyanidins/anthocyanidins and beneficial organic acids: ellagic, citric, malic, quinic, benzoic, chlorogenic, eugenol, ferrulic; also beta carotene, lutein and quercetin. In the 1920’s cranberry juice was widely used to prevent chronic urinary tract infections (UTIs) as it still is today. UTIs are usually caused by E. coli, that, like many bacteria have a hairy exterior which sticks to cells and allows the pathogen to take up residence there. This sticking is required for infection, so anything that prevents the sticking thus prevents infection – the actual killing of bacteria isn’t even necessary. The proanthocyanidins in cranberry are absorbed through the intestinal tract to enter the bloodstream and keep pathogenic bacteria from sticking to cells lining the stomach and bladder. Studies in Europe comparing different berries and berry phenolics, found that cranberry, cloudberry, raspberry, strawberry and bilberry especially possess clear antimicrobial effects against Salmonella, Staphylococcus and Heliobacter. Cranberry can also prevent plaque-forming bacteria from sticking to your teeth so cranberry juice can protect your teeth as well. Please note that if you make uric acid stones, the acids in cranberry can cause you to make more. Therefore if you have a genetic propensity towards gout, cranberry is contraindicated and it is necessary to alkalize one’s urine. Cranberry causes urine to acidify which is helpful for calcium oxalate stones, along with apple cider vinegar and lemon juice. Further research on by anti-viral specialists have found that the same compounds in cranberry that inhibit bacterial adhesion to host cells, also applies to the ability to block the adhesion and replication of influenza viruses, including those of the intestinal tract. Lab studies have shown that cranberry can work with the antibiotic drug Clarithromycin and enhance its effect against H. pylori, which causes ulcers. Six berry extracts plus a blend were tested: raspberry (Rubus idaeus), strawberry (Fragaria spps. ), cranberry (Vaccinium oxycoccus), elderberry (Sambucus nigra), blueberry (Vaccinium spps. ), bilberry (Vaccinium myrtillus), and a propretery blend of all six berries. All individual berry extracts significantly inhibited H. pylori, compared with controls, and also increased susceptibility of H. pylori to clarithromycin, but the combination of all six demonstrated maximal effects. This shows that plant synergy, especially true of plants rich in antioxidants, often increases their efficacy as medicine, something herbal formulators have know for centuries. In addition, cranberries are an excellent dietary source of phytochemicals that include flavonol glycosides, anthocyanins, proanthocyanidins (condensed tannins), and organic and phenolic acids all of which reduce tumor activity and have even shown to inhibit oral cancer cells. The storage of summer berries for the long winter months has always been a part of gathering for native peoples. Today, cranberries are widely available in nearly every form so make them a part of your winter wellness diet by including them at least two to three times per week.